If you love both the beach and the pool, then this water park is perfect for you. Your whole family can enjoy the five different cove pools, the sunken pool bar, and the highlight of this park: the three-story high pool slide! If you prefer spending time at the beach, then you can always choose to go kayaking, jetskiing, or ride the banana boat at their 525 meter white sandy beach. Another plus about this water park? It’s only a three-hour drive from Metro Manila! You will be amazed by this water park’s world-class Wave Pool that produces waves that can go up to three feet high! The several giant slides are just as impressive, namely the Three Giant Aqua Thrill Slides, the Big Horn Slide, and the Water Cottage Slide. They also have what they call the Pirate Ship Pool, which features six different kiddie slides. For those who prefer to have a chill and relaxing time, you can skip the slides and enjoy the Lazy River instead, as it takes you on a leisurely route around the 500-meter long pool. Five swimming pools, three water slides, and a beach?! What’s not to love, right? This water park has what they call the Island Pool, which has mini waterfalls and a swim-up pool bar. They also have the Beach Pool, which connects to their two other water attractions: the Wave Rider, an artificial tide pool and the Amazon River, for those who would prefer to take a relaxing ride around the pool. For some fun time at the beach, this waterpark also offers jetskiing and parasailing activities. This is the largest pirate-themed water park in the country! 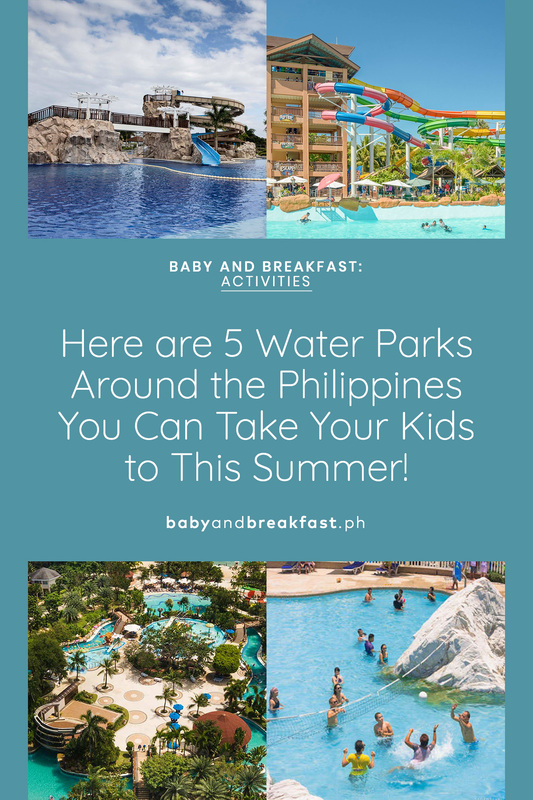 It has ten waterslides, a 400-meter long “lazy river”, a water play area for the kids, and two swimming pools: one with artificial waves and another one for the kids. The young and the young-at-heart are sure to have an enjoyable, unforgettable time here. What makes this water park even better is its convenient and accessible location, being only 20 minutes away from the city of Cagayan de Oro. Again, if you love both the beach and the pool, this water park has got both for you! The wide beach area, the six different pools, and the three waterslides, namely the Big Bowl Water Slide, the Rampage Water Slide, and the Seesaw Water Slide all make this park oh-so-fun. You can choose to try out hoverboarding and flyboarding too! Plus, you’ll love how this park is only a 12 minute drive from the Subic Bay Freeport, and how its got beautiful views of the sunset and the nearby mountain ranges. So while you and your family are having fun with the water activities, you get to enjoy some scenic views too! « 10 Exciting Activities You Have to Do with Your Family in 2019!